On Crunchify we have been playing with WordPress since year 2006. In the beginning, it was really a challenge for developer to come up with nice site/blog format. WordPress was new, core APIs were not mature, there were kind of no theme framework available. 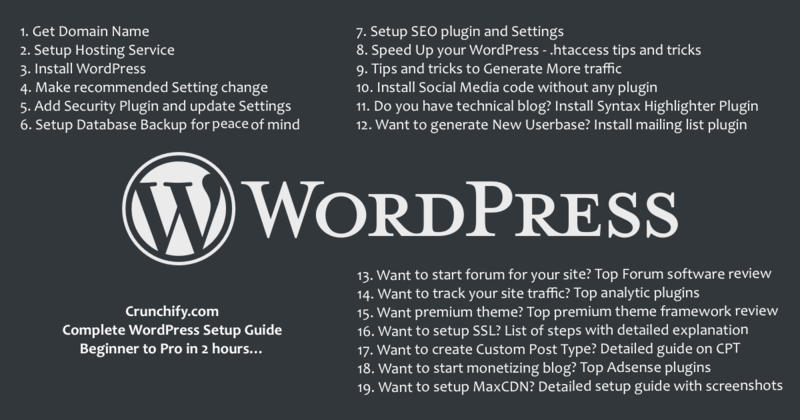 SEO tips and plugins were in very beginner stage. We have learn a lot during last few years and would like to share tips and tricks what we learn with readers. NOTE: we are not going to explain all points in details in this post but rather will provide link to an article which provides complete in depth knowledge. As we know, everyday something new comes up and new technologies, plugins, themes framework get introduced. We will keep updating all above mentioned tutorials periodically at-least every 3 months. So don't worry about stale content on this post and articles. Happy blogging and keep coming.